This poem is available through the Internet Poetry Archive sponsored by the University of North Carolina Press. For educational use only. 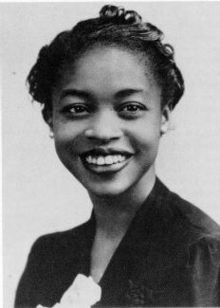 Margaret Walker (1915 – 1998) was part of the African-American literary movement in Chicago. Her notable works include the award-winning poem For My People (1942) and the novel Jubilee (1966), set in the South during the American Civil War. Didn’t she have a famous poem, “Songs of my People”? Is this an excerpt of it? Oh nevermind, just noticed the caption. I guess it was “For My People.” It’s a stunning and rhythmic work. This entry was posted on March 29, 2017 by Vox Populi in Opinion Leaders, Poetry, Social Justice and tagged African American poetry, African-American history, African-American poets, I Want to Write, Margaret Walker:.